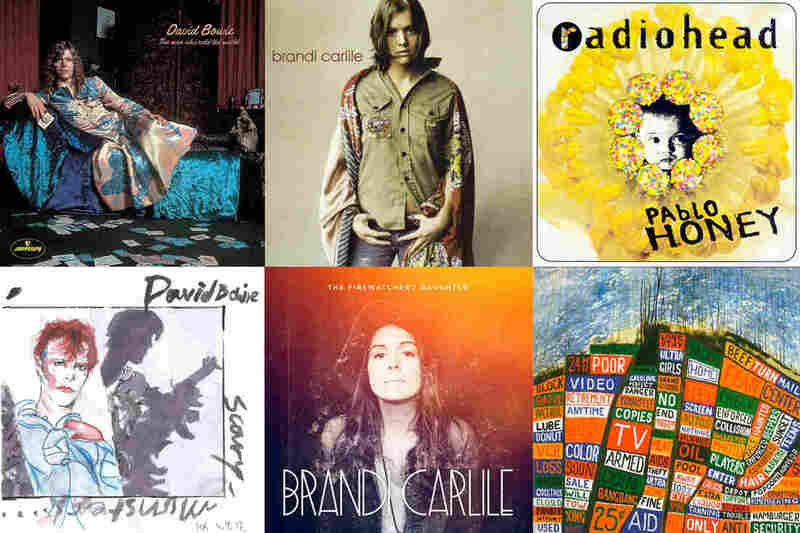 Radiohead, David Bowie And Brandie Carlile: A Musical 10-Year Challenge : World Cafe Thumbing through the catalogs of Radiohead, David Bowie, Brandi Carlile and more, World Cafe takes musical snapshots of artists 10 years apart. Exploring albums that were released 10 years apart from David Bowie, Brandi Carlile, Radiohead and more. Of course, with the pace of the internet, the 10-Year Challenge has since been set aside for something else. But since we're not ones for tossing dairy products at toddlers, we thought we'd revisit the 10-Year Challenge, except with a twist – musical snapshots of artists 10 years apart. Take, for example, Radiohead. If we're comparing it to the actual social media challenge, the band wouldn't even post its debut album, Pablo Honey. What a difference a decade makes with Hail to the Thief. There are artists who are consistently timeless, like David Bowie, and artists who create a moment in time only to find themselves 10 years later stretching for the next big sound. Whether that new sound works out or not is another story. Enjoy this playlist of back-to-back tracks from artists 10 years apart. Be impressed by the dynamic changes and consistent excellence, while occasionally cringing and asking, "What happened?"